This Agricultural Communications test bank is made up of 60 multiple choice questions over chapter two: Photographic Journalism. The questions were created using the Oklahoma Department of Career and Technology Education CIMC Communications in Agriculture, 2nd Edition textbook, copyright 2017. Note: This was made for the Oklahoma FFA's Agricultural Communications contest. While it may also be useful for other state tests or the national test, its questions were developed exclusively from the Oklahoma curriculum. 1. Define digital camera terminology. 2. Determine the elements of a good photograph. 3. Explain the types of photographs. 4. Demonstrate how to crop a photo. 5. Describe how audience affects photojournalism and how photography affects the agricultural industry. 6. 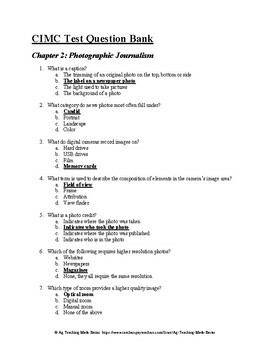 Explain the uses and characteristics of photography in agricultural communications. 7. Discuss the guidelines for legal and ethical practices in photojournalism.